Higurashi no Naku Koro ni Kira (ひぐらしのなく頃に煌, When They Cry Glitter?) is the second Higurashi no Naku Koro ni OVA, created to commemorate the tenth anniversary of the Higurashi franchise. The first volume adapts Batsukoishi-hen, while the remaining volumes have all-new original stories. Keiichi, Tomitake, Irie and Oishi speculate over punishment games for the girls in Himanizawa after Keiichi's recent string of losses in the games. Keiichi eventually falls asleep, waking up to the girls speculating punishment games for him. He blacks out again, waking up in the clinic, infected with the 'true' Himinizawa syndrome, along with Takano. The girls try to 'save' him, almost ending up killing him after Takano. Keiichi wakes up to the same situation as before, as Tomitake, Irie and Oishi infect him with the syndrome again in a parody of the original series. Rika wakes up in an parallel world where she is a magical girl known as Rika Oyashiro. 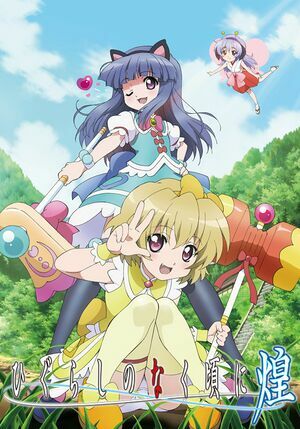 She and Satoko (who becomes another magical girl, Trap Satoko) must fight against the four evil generals of the secret magic society Tokyo Magika (Teppei, Takano, Okanogi and Takagi) to save their friends and the people of Hinamizawa from a number of demonic ritual tools and a strange fog that cause individuals to become hostile towards those unaffected. A love rectangle between Keiichi, Mion, Shion and Rena ensues, with the girls competing for Keiichi's affection through numerous methods. They decide on using a game of chance to pick whom Keiichi will go on a date, but he accidentally picks Oryo. A young Rika and Hanyu play a game of hide and seek before Rika is sent into a time paradox, where she finds herself sent into the future where everyone fought. Hanyu, while out for a walk, finds the scared Rika and offers to help her. Thinking back, she remembers a time when Rika disappeared while playing a game with her. With the help of the rest of the gang, they find a way to send little Rika back to where she belongs. Hanyu is reluctant at first, thinking back at how much suffering Rika has been through. Little Rika tells Hanyu she wants to go back and does so. Rika and Hanyu catch up with their friends after sending Rika back. This page was last edited on 29 May 2017, at 21:52.